"Relive the glitz and glamour of the golden age of Hollywood musicals. 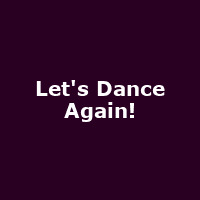 Let's Dance Again! brings dance sequences from these classic films to life. They are performed live on stage by some of the best dancers in the UK, back by guest singers and a full orchestra. This nostalgic evening includes sequences made famous by the likes of Fred Astaire, Ginger Rogers, Judy Garland, Gene Kelly, Mitzi Gaynor, Lesley Caron and Jane Powell."